Annual Retainer: A form of volume discounting of executive search services. Client agrees to pay so much per month, quarter or year, thereby establishing a credit account against which specific placements are billed. Encourages long-term relationships for greater efficiency, lower marketing costs, improved client service. Base Salary: The annual base salary paid to an individual, not including anything else, i.e. deferred income, incentive bonus, profit-sharing, stock options, tax shelters (or some type of compensation that permits estate-building), thrift plans, pension plans, life insurance, health insurance, long-term disability insurance, dental insurance, tuition assistance, payment for personal and family medical and dental expenses, cars, club memberships, loans, joining bonus and other perquisites (including, increasingly, some form of hiring bonus). Boutique: An executive search firm that specializes in one or more relatively narrow niches in contrast to presenting a generalist image. Bonus: The annual bonus, usually performance based and calculated as a percentage of Base Salary depending upon how well the individual met target goals as well as how well the company and division performed. Bundling: Relatively new term describing the talents required in today's "super executive" who is brought in to replace two or three others and is expected to reflect a "bundling" of all their attributes. Bad for executive recruiters in that there are fewer jobs to fill but good because super-execs are scarce & hard to find, requiring a professional search. Candidate: A person who survives extensive screening, reference-checking and interviewing and is to be presented to the client company for the position to be filled. Candidate Profiles/ Reports: Summaries prepared on each final candidate that usually include a complete employment history, personal biographical data, appraisal of qualifications, and initial reference information. Data is verified and submitted to the client for examination prior to the first meeting with the candidate. Career Counselors: Firms or individuals offering services to individuals. Some are legitimate but many are not. Generally these are not executive recruiters: this is not what the executive recruiters get paid for. Many career counselors have very poor reputations (Be wary of claims in blaring ads in Wall Street Journal, N.Y. Times, etc.). Services can include psychological testing, resume preparation, interview training, job-search planning, etc. Fees can run from modest to very expensive! Read fine print in contracts and check with legal counsel before making a down payment or signing anything with a career counselor. Extreme caution is advised. Client: Organization or Corporation sponsoring and paying the recruiter for a search. Code of Ethics: A necessary part of the process of self-discipline and to protect the interests of both client companies and candidates and assure them of fair treatment. A code of professional ethics helps the executive recruiter determine the propriety of conduct in professional relationships. It gives the client companies and candidates a basis for feeling confident that the professional executive recruiter desires to serve them well and places services ahead of financial reward. It gives clients assurance that the professional person will do his work in conformity with professional standards of competence, independence and integrity. Compensation Package: Total compensation can include various elements other than salary for senior executives: typically a mix of deferred income, incentive bonus, profit-sharing, stock options, tax shelters (or some type of compensation that permits estate-building), thrift plans, pension plans, life insurance, health insurance, long-term disability insurance, dental insurance, tuition assistance, payment for personal and family medical and dental expenses, cars, club memberships, loans, joining bonus and other perquisites (including, increasingly, some form of hiring bonus). Confidential Search: Quite often, it is important for the client to conduct confidential searches. When secrecy is necessary, it is virtually impossible to handle a search from within the organization. For example, a company may want to introduce a new line of products or acquire a new product or company before competitors learn about it. In such cases, a recruiter can work effectively on the company's behalf without disclosing the firm's identity until the final stages of the search. The company can make its selection and announce its plans after the new executive is on board. Keeping a search totally confidential requires considerable discipline and skill on the part of both client and recruiter. Once the client has been identified to the top two or three candidates, both the client and the recruiter must be ready and able to move fast to make a final decision and a public announcement. This is the only way to avoid possible leaks, and it requires careful coordination. Contingency Search: The search consultant who uses the contingent fee approach must fill the position before his fee is paid by the client. Directory of Executive Recruiters: Listing published by Kennedy Publications since 1971. Thousands of names and addresses with salary minimums and areas of specialty (indexed by management function, industry and geography). Updated annually. Employment Agency: Employment agencies normally limit their efforts to representing individuals who are actively looking for new employment opportunities within the local area. When an organization contacts an agency to fill a specific job opening, the agency usually reviews its files for applications from people with appropriate backgrounds and may place ads in local newspapers to attract additional applicants. Employment agencies often try to place their applicants in any of a large number of local organizations because they are paid by the individual applicant or employer only if a placement is made. They make the majority of their placements in the lower salary ranges. Their payment is a fee based on the employee's starting salary.. Some states also permit an advance fee or charge to the individual who lists himself with an employment agency. It is important to note that Executive Recruiters are not employment agencies. Employment Agreement: When the client organization and candidate have agreed on terms of employment, it is important to put these into writing as a protection to both parties. The employment agreement may take the form of a formal agreement or letter to the new executive spelling out everything discussed and agreed upon: job specifications, reporting relationships, base salary, benefits, moving costs, etc. The executive will then reply, usually verbally with the confirmation with signature in writing either digitally or via the postal service. Equal Opportunity Act: An Equal Employment Opportunity Commission was established in Washington, D.C. in 1964 to prevent employment discrimination. (The Roosevelt Administration established a similar organization to prevent such discrimination during World War II.) Although the law demands that women and other minority employees be considered for executive positions at various levels, most organizations, for example, lack candidates with both the education and experience required for such positions. Consequently, a growing number of these organizations must look outside for qualified individuals from the relatively small pool of qualified middle and top managers. To help such companies, some search firms have set up special departments to recruit such executives. Others specialize in this field. Evaluation of Candidates: At a convenient time and place, the recruiter interviews the prospective candidate to verify the original information gathered during the process of sourcing and researching, to examine his background, aptitudes, strengths, skill sets, interests, personality, in depth to determine if the person will be appropriate for a specific position. These appraisal interviews develop an in-depth picture of each candidate: employment background, business philosophy, career objectives, potential and personality characteristics. Education and employment, background and credit checks are usually verified and reference checks are conducted, usually with Bosses, Peers and Subordinates. From the group of prospective candidates evaluated, several of the best-qualified are selected for introduction to the client. During this phase, the recruiter's breadth of background, depth of insight and sound judgment are critical. Exclusive Search: An Exclusive Search is sometimes similar to a Preferred Search, in which a client retains a recruiter exclusively to identify and appraise executives well-qualified to fill a specific management position. An initial down payment can secure the search firm and subsequent payments are usually dependent upon reaching certain performance criteria. Executive On-Boarding Process or Assimilation Process: The process of integrating the new executive into the organization. This is a critical process/ stage of transitioning to a new company and we highly recommend a formal On-Boarding process developed by the prospective employer as well as the creation of a jointly developed and agreed upon first 90 day plan. Executive Recruiting: The service performed for a fee by independent and objective persons or a group of consultants organized as a firm or similar entity. Executive recruiters help managers of client organizations identify and appraise executives well-qualified to fill specific management positions in commerce, industry, government, and the nonprofit field. Their fees are paid by the organizations that retain them. This highly specialized area of the management consulting profession started as a normal service rendered by general management consulting firms. Executive recruiting firms, also known as executive search consultants, generally bill their clients monthly as a retained search progresses and deduct these payments from the total fee, or other variations of search agreements will have payments from the client company to the executive search firm based on achievement of performance criteria. Executive recruiting consultants are willing to receive resumes from executives seeking new job opportunities, however they are being paid by a corporation to find the right candidate for a very specific position and they are not being paid to help executives find jobs. Executive Search: Synonym for EXECUTIVE RECRUITING. Expenses: Corporations with the position to be filled are usually interested in picking up the expenses related to bringing candidates in from areas outside of the local commute area. There are many ways to process these expenses. Often for expediency the candidate will be asked to make the arrangements and will be reimbursed. When there is time, corporate HR departments will usually make the arrangements and pick up the expenses up-front. Depending upon the contract between the client company and the Executive Recruiter, often out-of-pocket expenses specifically for a given search are incurred but generally all expenses and the parties responsible are agreed upon in advance. Fee: The total fee paid by the client company to an executive recruiting company for a search assignment. Recruiting fees vary widely with some recruiters charge clients a percentage of the first year's total compensation for the executive hired plus out-of-pocket expenses to a percentage of first year’s base salary to a flat fee. Traditional Retained Search recruiters are paid at least a portion of the fee for their services whether or not a placement is made. Front-End Retainer:. During the course of a search, clients are invoiced monthly for agreed-upon fees, plus out-of-pocket expenses. These monthly installments generally range from one-third to one-fourth of the total fee involved. They are sometimes called "front-end retainers" and are credited toward the total fee when the individual is employed. Usually a final billing for any remaining fee is rendered at that time. Retainer recruiters require a payment before commencing a search. This is also called a "front-end retainer." Guarantee: Promise by the search firm to replace a failed candidate within a certain period of time. The length of time is usually dependent upon the level of the candidate placed: the more senior the position, the longer the guarantee period (usually 3 to 12 months). Headhunter: Formerly pejorative term for executive recruiter, currently used more in a jocular and light-hearted sense than critically. Hiring Bonus: A one-time payment originally intended to compensate a joining executive for extra expenses occasioned by a major move. Now viewed somewhat more broadly, though not quite like a professional ball-player "signing bonus," The concept can include: compensation for "lost" bonuses at the company the executive is leaving. It can also be a device to compensate for some moving expenses or even possibly lower salary scales in the hiring company. A hiring or joining bonus, then, is whatever it takes in addition to total compensation to convince the candidate to join. The amount can range from a few thousand to over a million dollars, sometimes paid half on joining and half six months later. Often hiring bonuses and / or relocation expenses will be required to be paid back if the candidate resigns prior to one year. Interview: Another term for both preliminary and appraisal interviews which are conducted for the purpose of assessing prospective candidates. Job Description: This describes the client position to be filled and outlines the desired characteristics and experience that the executive being sought should possess. When approved by the client, the "specs" become the guidelines for the search. Length of Recruiting Assignment: The average recruiting assignment takes three to four months from the initial meeting with the client until the candidate is finally selected. Once a new executive is selected, it may take two to four weeks or more before he or she actually reports to work. An assignment may take as little as a month or two if everything goes right, but this is rare. On the other hand, a search may take six months to a year. When it lasts that long, chances are that the position was impossible to fill, the specifications were changed, the client was not available to meet candidates or didn't really want to fill the position, the recruiter miscalculated, or something else out of the ordinary happened. Off-Limits Policy: A key issue in executive search. Refers to the recruiter agreeing not to approach executives in a client organization. Factors are definition of "client" and time: the whole corporation (e.g., Ford Motors) or the division the search was done for (Jaguar), or some even more specific entity, and the off-limits policy is usually for one year post the last date of contract activity. Outplacement: When executives are fired or dropped by various kinds of organizations today, they are often referred to outplacement consultants. These specialized consultants analyze their abilities and counsel them on how to prepare resumes and find new careers. Outplacement consultants work for and are always paid by the firing organization providing a service to the displaced executive. Personal Chemistry: There is a rough analogy between mixing chemicals and mixing executives at the top level. By combining executives, an organization can achieve synergy, or neutralization, or can produce explosions. The daily newspapers verify this chemical analogy as it operates in the executive suite. The search for a new executive is part of a process of organization change, often with traumatic implications. Preparing for this change and tackling the inherent integration problems are essential if the needs of the individual and group are to be met. In their evaluation of prospective candidates, professional recruiters try hard to determine whether the personal chemistry will be appropriate. A few recruiters help clients integrate new executives into the organization on as firm a footing as possible by means of formal programs. Interpersonal breakdowns can create enormous organizational cost, and it is important to anticipate and head them off. Placement: The act of an executive recruiter filling a client position. Preferred Search: A Preferred Search is one in which a client retains a recruiter to identify and appraise executives well-qualified to fill a specific management position. An initial down payment secures the search firm and subsequent payments are usually dependent upon reaching certain performance criteria. Professional Practice Guidelines: These are standards of good practice for the guidance of executive recruiters. They make for equitable and satisfactory client relationships and contribute to success in recruiting. Progress Payments: Monthly payments made to the recruiter by the client company for agreed-upon fees, plus out-of-pocket expenses during the course of the search. Frequently cited as a key difference between Contingency and Retained Search. Psychological Testing: Professional search consultants develop their own evaluation methods. Formal psychological evaluation is almost always left to the client's discretion. If a client has doubts about the fitness of a candidate, psychological evaluation may be indicated. But it is not likely that the search consultant will use psychological testing as part of its own selection process. Ratcheting: The benefit to retained or contingency recruiters charging placement fees to the client company on a percentage basis: the higher the salary at which the candidate is hired, the higher the fee (some companies eliminate even a hint of conflict of interest in such instances by charging on a fixed-fee basis). Records Maintenance: Professional recruiters have clear policies known to their staffs regarding the retention of records and coding in compliance with existing laws and regulations on federal and state levels, together with the spirit of the various privacy acts and legislation protecting the individual. Recruitment Advertising: Professional recruiters feel that advertising with regard to a particular assignment should be done judiciously and only with the approval of the client. It should state the position clearly and be used with discretion. Absolute honesty in statements and actions should be observed in the text of the advertisement. 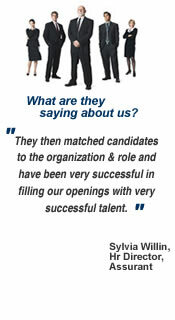 References: Persons to whom a recruiter refers for testimony as to a candidate's character, background, abilities, etc. Executive recruiters usually take references proffered by candidates only as a starting point. They then confidentially seek out former superiors, subordinates, peers, colleagues, vendors, suppliers, etc., to get an independent and objective evaluation of the candidate. See below. Reference Checking: After intensive interviews with the candidates (but before introduction to the client) the recruiter will begin to check references. Initially the recruiter will be limited to references provided by the candidates. These are likely to be favorable. However, from these references the recruiter will obtain others (known in recruiting as second-generation references) who will be likely to provide a more objective picture of the candidates. It is vital that the candidate not have his current job jeopardized as a result of these checks. In addition, the client often wants the search to remain confidential at this stage. For these reasons, it is customary to defer an in-depth development of reference information until mutuality of interest has been determined. Reference investigation and reporting should be conducted with the candidate's prior knowledge; within the spirit and intent of applicable federal and/or state laws and regulations; with persons considered knowledgeable about the candidate and whose information can be cross-checked for objectivity and reliability; and with respect for the personal and professional privacy of all parties concerned. References used today are rarely in writing from the person giving the reference, they are usually conducted as telephone interviews and notes or transcriptions of those interviews are submitted to the client company. Reimbursable Expenses: All recruiters incur out-of-pocket expenses in their day-to-day search activities. Typically, there are travel expenses for both recruiter and candidate, related costs for hotels, meals, long-distance telephone calls, printing and other related costs. Some recruiters charge for their reimbursable expenses at cost while others may add a service charge. Some charge for secretarial, research and other support services while other recruiters absorb part or all of the expenses. Reimbursable expenses may run from 10 percent to 25 percent of the professional fee or more, depending on such factors as length of assignment, location of client and the majority of candidates, number of offices used by the recruiter and salary range of the position being filled. International searches covering several countries obviously incur higher expenses. Research: The foundation of professional recruiting is research. All well-established recruiting consultants maintain research facilities to develop background information about industries, companies, and key executives. In a rapidly changing business environment, constant research is the principal guarantee against superficial or haphazard research work. Resource: Someone who can possibly recommend a candidate for a specific opening. Resume: A brief account of personal and educational experience and qualifications of a job applicant. The resume is the first formal contact between a company and a potential employee, and in some ways, it is the most critical. Human Resource officers in most major corporations can usually give only 20 to 30 seconds of attention for each of the many resumes they see every day. So, to make the best impression, an applicant's resume must be constructed in such a way that it provides the most pertinent information about him or her in the simplest and most easily digestible form. The information should be brief, complete and easily accessible. Retained Search: Retained search is one in which a client retains a recruiter to identify and appraise executives well-qualified to fill a specific management position. An initial down payment is followed by progress payments, and the full fee may have been paid before the position is actually filled. Retainer: A retainer fee (usually paid monthly) for professional services for an agreed-upon period of time. Search Process, The: The task of identifying and appraising well-qualified executives is painstaking and time-consuming and must be governed by an orderly approach consisting of several major steps or phases if it is to be successful. These steps represent the broad phases of a typical search assignment and identify the major areas of activity involved in the work that recruiters do for clients. These steps are interrelated and interdependent, but they are often adapted and modified by search consultants as they work out their own approaches to client engagements. The professional search process does not depend on luck, shortcuts, or gimmicks, but on a step-by-step procedure, whereby a list of potentially suitable executives is reduced to several uniquely qualified candidates. In outline form, the successful search consultant must: meet with the client to discuss the engagement in depth; develop a strategy or search plan; review files and previous search assignments; contact candidates and evaluate them; check references make recommendations participate in the interview process through negotiations; and follow-up with the client and executive to see how things are going. The aim is not merely to produce qualified candidates but the very best candidates available for the position. Source: Person or organization that can suggest possible candidates to a recruiter during a search. Specialist vs. Generalist: Increasingly, clients demand a certain amount of industry or functional knowledge from the executive recruiter. Exclusive practices have sprung up in banking, healthcare, training, hi-tech, finance, etc. Yet there is always the demand, in addition (especially at higher executive levels), for the generalist viewpoint. Some industries lend themselves to recruiter specialization, i.e., those with a large number of non-competing units nationally (banks, hospitals). Others, with a high concentration of firms (automobiles, for example) do not lend themselves to specialization. Total Compensation: See COMPENSATION PACKAGE. Types of Executive Recruiters: These include independent individual recruiters and recruiting firms, executive recruiting divisions of management consultant firms and certified public accounting firms, and internal recruiting departments in companies.